My new friend @tommyismyname wrote a thought provoking post today about the duality of our existence in Social Media – the temptation to create a character while also wanting to be authentic. The struggle to be yourself while also creating a persona or a brand is something I have thought a lot about myself. I was trying to think of an example of a person who seemed to have similar struggles and who ended up benefiting from and blooming as a result of new-found authenticity. Then it hit me – one of my heroes, John Lennon. One thing becomes apparent when you read about The Beatles or when you listen to interviews (even the interviews from the at the time 3 remaining Beatles from The Beatles Anthology). During the early years of Beatles fame, through, let’s say, Help!, the Beatles each created caricatures of themselves. They really had to do this to protect themselves from the onslaught of media and fan attention that haunted them at every turn. George was known as the “quiet” Beatle. Paul was the romantic. John was kind of the brooding Beatle. Even at the height of fame, John couldn’t avoid letting some of his true self show. He wrote songs like “Baby’s in Black,” “Hard Day’s Night, and “Help,” songs that didn’t mesh entirely with the head-bobbing, happy-go-lucky image the Beatles as a band were sending out at the time. You sense, as you watch interviews with him during this time, that people weren’t getting the real him, and you sense that he was struggling with that. He talked in interviews about how people came to see the Beatles for the experience, and how he easily could have been replaced with a mannequin and a sound system. The feeling of being replaceable is comparable to what happens in Social Media when you try to jump in as a caricature of yourself. As I told Tommy, when I first started doing this, I envisioned creating a “character” called Read Life Mad Man. I thought that I’d be able to make quips about how we sure didn’t do marketing like they do on the show, or “it sure stinks being a woman in a man’s world. Oh wait, it’s not 1967. What’s going on?” I was going to try to intersperse little comments like that with useful information (perhaps like the songs that John wrote while he was showing his clownish exterior). During the time that I tried that approach, I was uncomfortable, I was frustrated, my blog traffic was pretty much nothing, and I was right around 67 followers for about 3 months. After a few experiences that he couldn’t ignore, John decided that he wanted to use his extremely unique position to actually use his brilliance for some good things. He started to speak out against the Vietnam War, and he started to speak out against Britain’s continued efforts to remain “the great empire.” As you probably know, John encountered quite a few hardships as he began to show his true feelings. The people who had thought he was just another happy rock star (a myth in itself, clearly) were a little taken aback. He angered several countries, and then, of course, there was the “Jesus” incident, where John’s frank words about how people were more excited about a Beatles concert than they were about Jesus became interpreted as “We’re bigger than Jesus now.” In Social Media, this might be a tweet that gets taken out of context, or a tweet that the wrong person sees. Just like on Twitter, there was no taking it back. It is the biggest fear people have about being authentic. If you are bullied, if you are quoted out of context, there is no rewind key, and even more frightening, you have no idea who can take that bad information and run with it. Regardless of what you might think about the Yoko Ono chapter of John’s life (I think he made a lot of mistakes in his treatment of Cynthia & Julian, but I also think that the way many people treated him and Yoko was tragically misinformed and bigoted), you have to admit that the music on the Plastic Ono Band record is about as far removed from Meet the Beatles as one could get. Not only was this John being himself, it was John showing the entire world all of his demons. It was the chip on his shoulder melting into a pool of vulnerability. Regardless of what you think of the songs on that album, you have to admit, that takes some amazing strength and bravery. I certainly have not gotten that point in my Social Media world, and really, my various and sundry vulnerabilities aren’t all that relevant to helping people in the world of business, so I wouldn’t wait for my own version of The Plastic Ono Band to come out. However, I think the act of being yourself can be just as scary as being yourself and completely vulnerable. I started acting like myself on Twitter almost by accident. People like Lisa Alexander and Suzanne Vara kept saying hi and responding to my posts, so I would chat with them. Then I got involved in Blogchat and the multitudes of chats after that, and found that you don’t really need to worry about being a caricature or bleeding all over your twitter stream. You can just talk to people. Is it scary? Sure. If someone doesn’t like how you say something, that’s the real you that they’re saying that to. It’s risky. It’s scary. By the same token, though, people who engage with you know that you’re not going to be an entirely new person when they talk to you on the phone or when they meet you in real life. You are who you are. It sounds so easy, right? Ultimately, “John Lennon the Beatle,” or “John Lennon the Walrus,” evolved to become, quite simply, that guy John. He was a dad. He was a husband. He baked bread. He went to coffee shops. And occasionally people would ask him when the Beatles were getting back together. 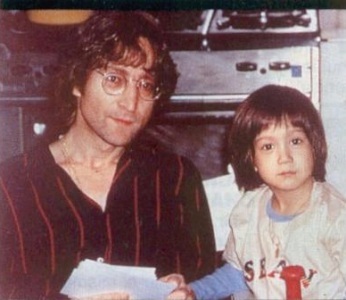 Ultimately, we remember John Lennon for the spectrum of authenticity his career followed. We remember the brilliance of Beatles days, but those seem all the more special when we realize how far askew that persona was from who John as a person really was. We remember John because, in the end, he got the courage the be the one thing he had run away from for years. Himself. Can you get to a point in Social Media where you are “just” you? What does that mean? What is your “baking bread” daily activity? For me, it’s writing here, reading elsewhere, and sharing ideas on Twitter. It’s really quite blissful, but it took awhile to get here. If I can help you in any way with your struggle, or if you have questions, let me know. We are creating characters but yet also being ourselves. That is a bit confusing however at the same time we are walking through this social media and creating platforms that have info about us (which in essence is us telling people what want them to know OR what we think they want to know). That is part of the character. Then we update these profiles with real updates that show who we are when we reach out to people, talk to them. Here some also create a character that they try and live by but some how the true person always comes out. I think that when people hear character they think of this fictional person they would create. No, it is a part of the person that you want people to think you are. Wow, that is taking it to the next level! I would say this…if you are putting out a character in the sense of, “This is who I hope to be someday,” could that not still be construed as fictional in a way? You’re still trying on a persona that isn’t really who you are, even if it’s who you want to be.